Currently available as a PDF from Wargame Vault. An innovative spaceship miniatures rule set grounded in real physics. 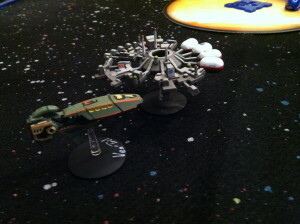 For two players commanding 5 to 15 ships each. Plays in 3 hours. The core mechanic that differentiates Starships from other spaceship games is its movement, which is based on science fact. The rules are clear enough that math is unnecessary, and apply to ships, missiles, and fighters alike. Simultaneous turns that don’t require pre-plotted moves. Rules for handling situations other than move and shoot. Simple damage rules (the focus of the game is the movement). Garden worlds, gas giants, asteroids, and comets. The PDF also includes Quick Reference Sheets and printable counters.